This is Market St Lane viewed from the Mincing Lane end, where the Dun Horse pub is (it would be to the right, just out of shot) and we're looking towards Darwen St in the distance. You can see the upper two storeys of the Legs 'O' Man pub at the far end. 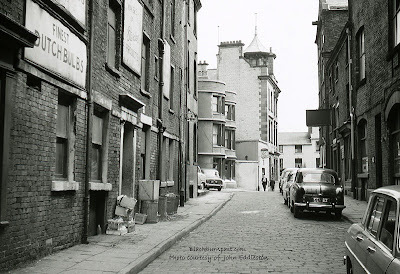 Towards the bottom of the street, on the left hand side, are the rounded bays of the Castle Hotel, a pub remembered by many as the Dirty Duck in the 1970's and later as Mr G's nightclub in the 80's. Both of which I visited frequently during those decades, as well as the 'Millstone' venue which was upstairs for a few years (1974 - 1976/7 approximately) and the disco they had in the cellar in the mid 70's. Sadly this fine old hostelry, which had stood there for close on 200 years or so, was demolished a few years ago and as with other parts of the town centre, sweet Fanny Adams has been put in its place. Progress? I don't see it that way personally. This 1963 view would have looked exactly the same to our Victorian and possibly even our Georgian ancestors and still looked more or less the same until the mid 70's when the properties on Darwen St went. But the biggest change to this scene came at the start of the current century, when a local businesswoman decided we needed town centre apartments and the stupid council agreed. A failed development that has left us with nothing more than a folly, a blot on the landscape. All parties involved should hang their heads in shame for allowing such destruction.